Accessible Pedestrian Signals: History of APS in the U.S.
Home > Chapter 1: Introduction > History of APS in the U.S. Although there are reports of audible pedestrian signals in the U.S. as early as 1920, they were not included in U.S. standards and regulations until MUTCD 2000. Common devices were bells or buzzers designed by engineers in response to a request from individuals who were blind. Earliest reported installations were near schools for the blind. 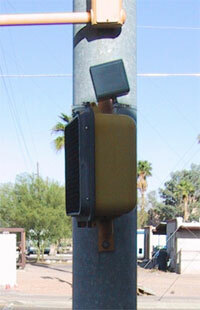 Cuckoo/cheep signals mounted on the pedestrian signal heads (pedhead-mounted APS), based on a Japanese system, were marketed in the U.S. These signals emitted sound from an overhead speaker only during the WALK interval and were typically aimed toward the opposite end of the crosswalk. Other types of devices developed in Europe and Australia (see Chapter 10, International Practice, Sweden and Australia) were not marketed in the U.S.
For early installations, there were complaints about noise of the signals from residents living near installations. American Council of the Blind (ACB) supported use of APS to provide additional information at all intersections. While each of these consumer groups have a membership of approximately 25,000 people which combined represents less than 1% of people who are blind or who have low vision in the U.S., this disagreement was often very confusing to community officials. While the NFB has now stated that APS should be used in some situations, they are still opposed to "wholesale" installation at every intersection. See Appendix C for detailed information on research results. Two-sound system (cuckoo/cheep) does not provide unambiguous indication of WALK. Requires blind pedestrians to know their direction of travel at all times. In the mid-1990's, APS that were integrated into the pushbutton, based on the European and Australian systems, began to be available in the U.S. These APS provide audible indications from the pushbutton at a generally quiet volume, intended to be heard 6 to 12 feet from the pushbutton. 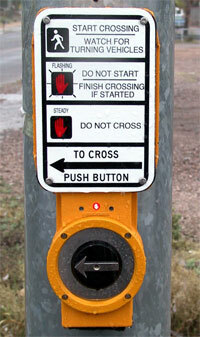 The functioning of pushbutton-integrated APS is based on proximity to the crosswalk location. The closer the APS is located to the departure location, the quieter it can be. In addition, the vibrotactile indication and tactile arrow are not usable when located too far back from the street. Figure 1-4 illustrates installation recommendations. Changes in intersection design, traffic, and signalization have affected the ability of pedestrians who are blind to cross streets using traffic sounds, as discussed in detail in Chapter 2. APS currently available in the U.S.
APS provide an auditory (tone or speech) indication of the WALK interval. Vibrotactile indication of the WALK interval is also required by the MUTCD , but not all APS devices available are capable of providing vibrotactile indications. Numerous other features are available and detailed descriptions of the various features can be found in Chapter 4. In the previous version of this document (Accessible Pedestrian Signals: Synthesis and Guide to Best Practice), APS were described as one of four design types: pedhead-mounted, pushbutton-integrated, vibration-only, and receiver-based. These device design types were mainly categorized by the location and type of WALK indication provided, although there were characteristic differences in other features at that time. As technology has developed, several combinations of these different types have emerged, and modifications have been made that prevent easy separation of devices into four 'types'. The discussion of APS and their features using those terms becomes confusing. 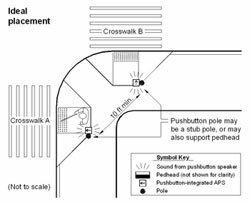 This Guide, proposed PROWAG (by incorporation of the MUTCD), and the MUTCD all recommend APS that have audible and vibrotactile WALK indications, which are only available when APS are integrated into the pushbutton. However, other features, such as additional beaconing speakers, may also be provided. In this Guide, other than this chapter and Chapter 9, the labeling of types of APS has generally been dropped. These types are described here for clarification, as background information. Some manufacturers or distributors may continue to use these terms to describe available products. Common in Europe and Australia and the required type in the US for new installations in the U.S.
A regularly repeating quiet locator tone provides information about the presence of the pushbutton and its location,(during the flashing and steady DONT WALK intervals). Most common type installed between 1960 and 2000 in the U.S.
Vibrotactile-only devices do not conform to the MUTCD 2009 requirements.